Amplifying the fiddle is a tricky business. When possible, I prefer to play into a microphone, which tends to capture a better sound, but in louder situations (e.g. playing with a drummer) using a pickup is the way to go. I continue to learn about how to get the best amplified fiddle sound, but I have some insights based on my experience which might be helpful to folks just starting down this path. What follows is part one, in which I discuss the pickups I'm currently using. In part two, I discuss the preamps I've used. I bought the L.R. Baggs pickup after using a Fishman pickup for a while. I was sometimes able to get a good sound out of the Fishman, but it didn’t really seem to like my fiddle, and I didn’t like how easy it was to move around and knock loose from the bridge. The tone was sensitive to the placement of the pickup, so slight movements could be disastrous. Sometimes it sounded like a horn, but not really in a good way. I know other fiddlers who have had success with the Fishman pickup, but it wasn't the one for me. I was pointed toward the L.R. Baggs violin pickup after discussing options with fiddlers I heard whose tone I enjoyed. Unlike the Fishman, the pickup is built into a new bridge. When you receive the bridge, you will need to take it to a luthier to have it shaped appropriately to fit your fiddle. I like the L.R. Baggs pickup because it captures a balanced sound across the range of the instrument without. It's a well-made, widely used pickup that is endorsed by lots of great players. It's feedback-resistant (I've never had a problem) and is designed to eliminate extraneous noise. In my experience, it does dampen and slightly change the acoustic sound of the violin. Part of this effect could be from the new bridge, but I think it's mostly due to the pickup itself. The muting effect is fairly minor, but it's there. I'm lucky enough to have two fiddles, so I put the L.R. Baggs pickup on my older fiddle and left my nicer-sounding violin unmodified to preserve its acoustic sound. This pickup comes either with or without a carpenter jack, which attaches to your instrument like a shoulder rest and allows you to plug in a 1/4-inch instrument cable. If you don't already have a carpenter jack, go ahead and buy the one that has it included. The Bottom Line: L.R. 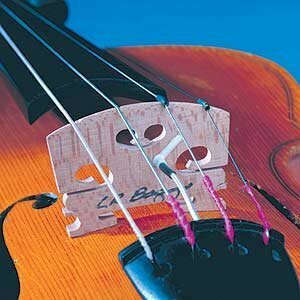 Baggs makes a great sounding violin pickup that has worked well for me over the last . The only caveat is a possible alteration of the acoustic sound of your instrument, but if you're cool with that this a great way to go. I really dig this pickup. It’s a cool design: the pickup is contained in a plastic/rubber belt that wraps around the fiddle behind the bridge and is held on by velcro. This is a great option for those who don’t want to permanently affect the acoustic sound of their fiddle. I’ve been using the Band more recently since I haven’t had access to my Baggs-equipped fiddle and I’m enjoying it. The sound is warm, balanced, and representative of the acoustic sound of my fiddle. I’m able to crank it up fairly loud without feedback issues (for instance, with Silas Lowe’s country band) and it also sounds great in the context of a bluegrass band. This pickup is more expensive than the Baggs, but also consider that you won’t need to take your fiddle to a luthier for installation. I have two minor issues with this pickup. The first is that when the pickup is attached, it sometimes gets in the way of how I hold the instrument, since it ends up being very close to where my shoulder rest is placed on my fiddle. The other problem I've had is that the velcro adhesive has softened, potentially due to my living in a warmer climate. The Band hasn’t fallen off of my fiddle, or even come loose, but when I pull it out of my case I sometimes have to re-stick the velcro to the plastic belt. This is a drag, since my fingers can end up sticky from the adhesive before a gig. I contacted support and it seems like a relatively rare issue (good news for everyone not having this issue, I guess). They’ll fix it for free if it’s under warranty, but since mine is no longer covered I’ll just repair it myself with an appropriate adhesive sometime. 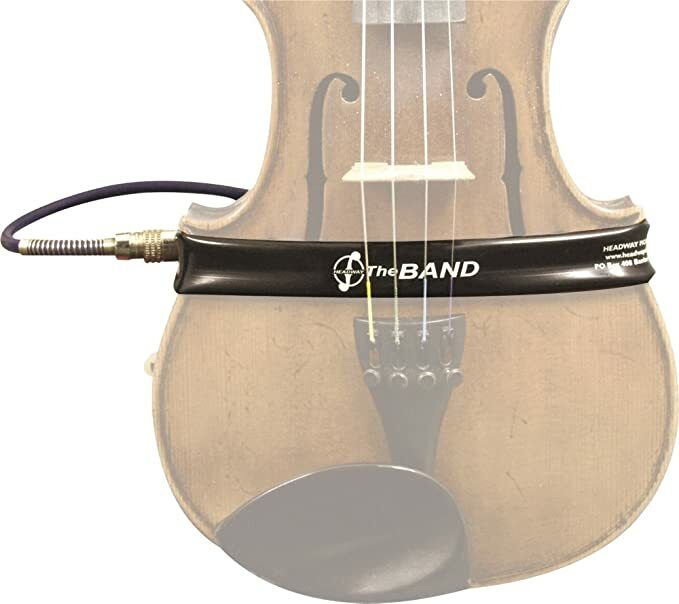 The Bottom Line: The Headway Band sounds wonderful and doesn't require a permanent modification to your violin. This is great for anyone who needs to amplify, but wants to preserve the acoustic sound of their instrument. Some maintenance may be required. Hopefully that's useful information! If you have questions or comments, feel free to drop me a line at andy@andylentz.com. If you have experience with these or other pickups I'd love to hear from you. I haven't tried them all! Your comments might appear in a future blog post -- with your permission, of course.